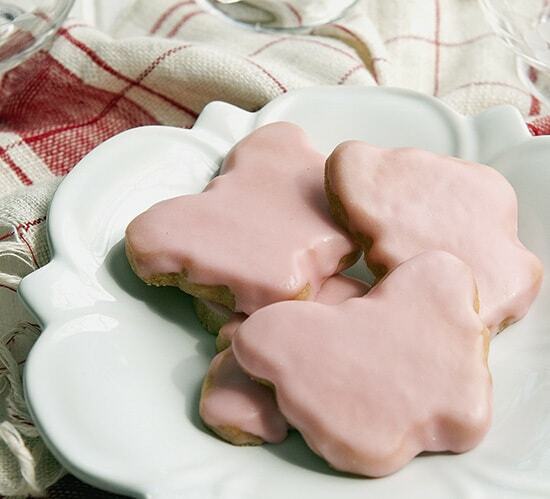 Pink Shortbread Cookies are classic shortbread/cutout cookies with a simple icing. 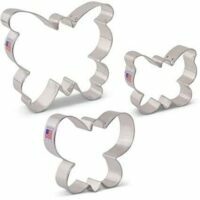 I share an easy method for rolling out the dough and cutting it into shapes such as these butterflies. 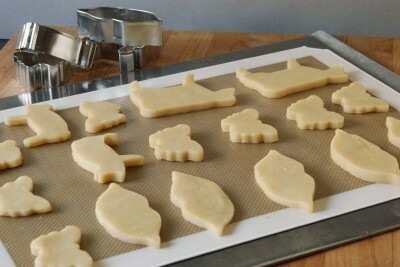 For most people, myself included, cut-out cookies are reserved for holidays. They seem like a lot of trouble, don’t you think? 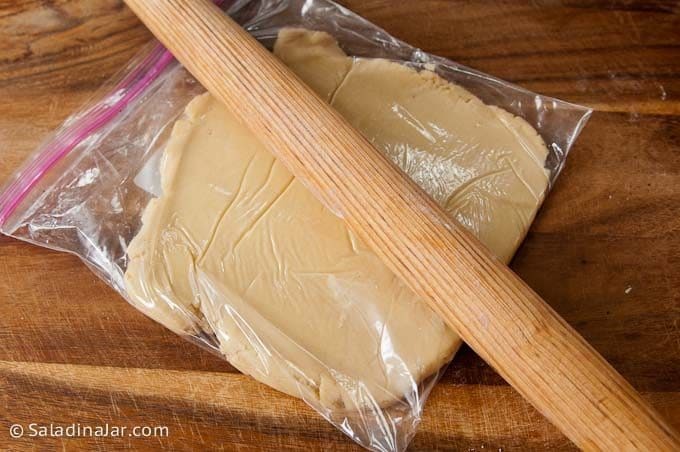 Sticky dough, cleaning up the sticky dough, getting the shaped sticky dough unstuck from whatever you’re rolling them on and transferring the cookie to a cookie sheet, etc. Ugh! On top of that, they need to be frosted. Furthermore, the kids usually want to decorate them, too. Just thinking about the potential mess is a “Calgon” moment. The other day, I ran across a great idea in Dorie Greenspan’s Baking cookbook. It’s so easy! 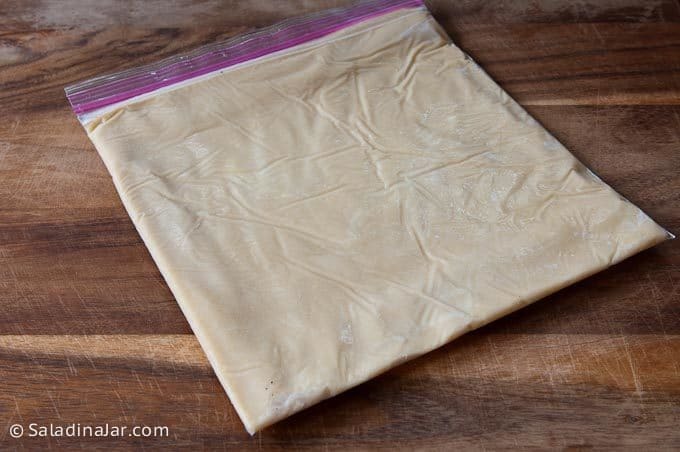 Simply put the dough in a gallon-size Ziplock bag and seal. 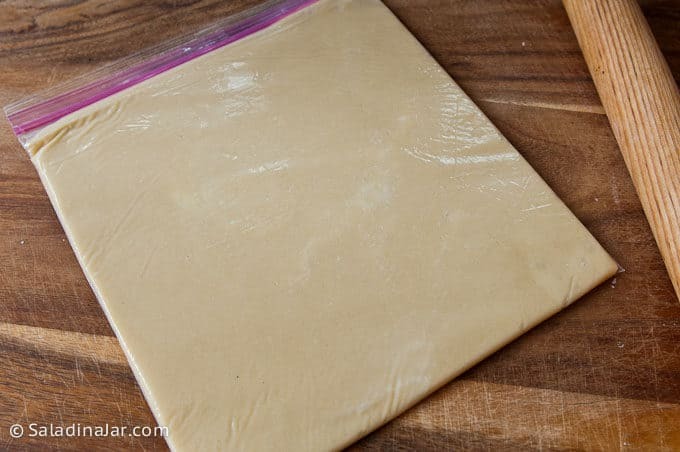 Roll the dough until it fills the bag and is a uniform thickness. 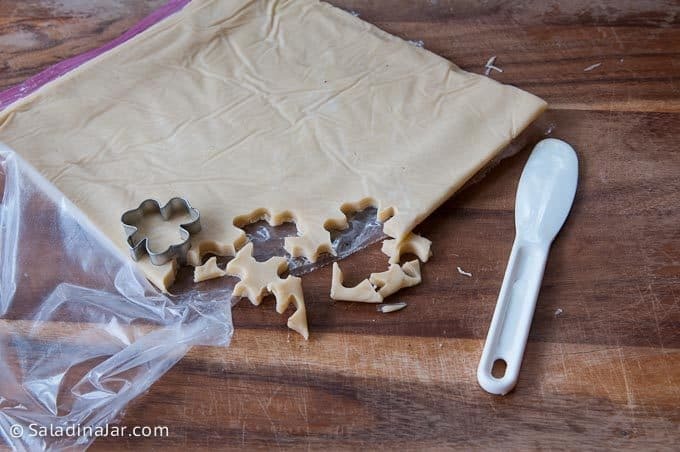 Small cookie cutters are recommended for this recipe. 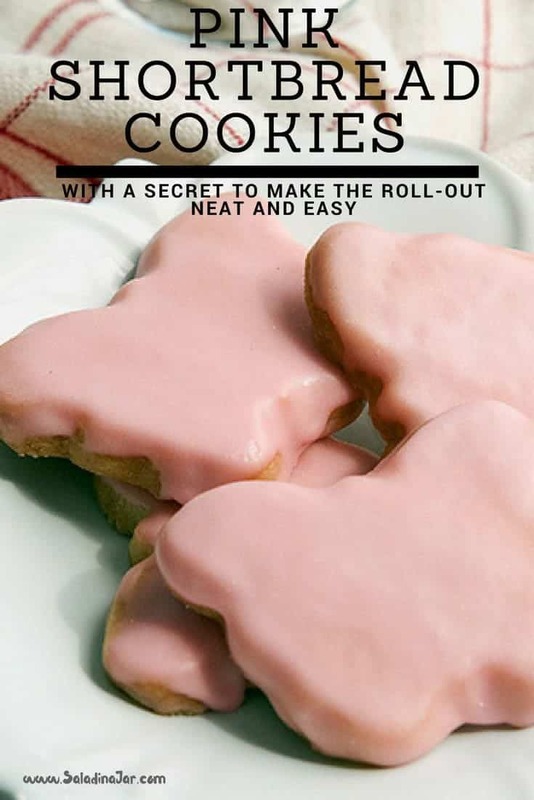 Not only are small cookies more appealing to eat at parties, but they’re easier to handle before they’re baked. 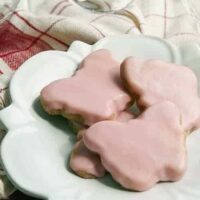 Posts Related to "Pink Shortbread Cookies:"
Hi, I am looking for a glaze to put on top of shortbread cookies – is this icing more like a glaze rather than a thick icing? and does it harden just a bit after it has dried so that the cookies could be stacked on top of each other? Approximately how many cookies do you get per batch? I realize it probably varies depending on the size cookie cutters you use, but on average? The original recipe predicted 20 cookies but that is a full-size cookie. It makes at least 2-3 times that many of the smaller cookies that I like. I’ve made this receive 3x in 3 days. Totally in love. My very picky eater may actually gain weight with these in the house as a reward. Delicious! Look delicious and adorable. Do they freeze well? Love the plastic bag idea! 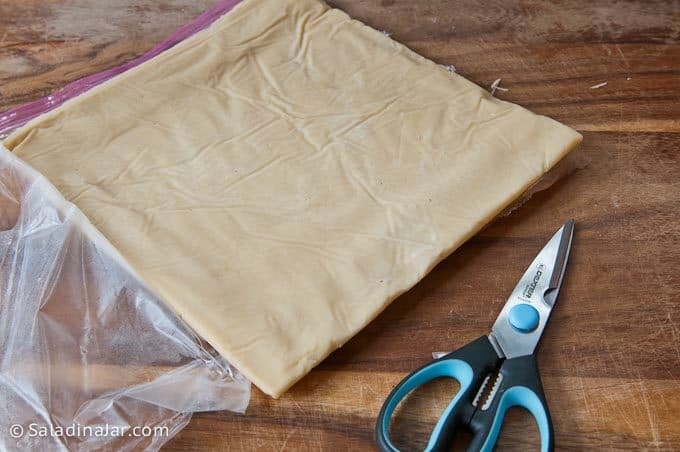 I hate using a pastry cloth! This sounds so easy! 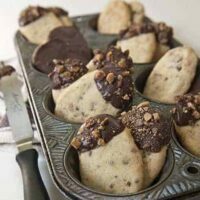 Haven’t made cut-out cookies in about 15 years b/c they’re such a pain to roll out, but now– must try! Thanks. Bonnie, the idea of rolling out cookies on a floured surface doesn’t appeal to me either. 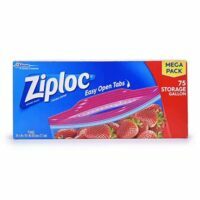 Ziploc bags are my friends! 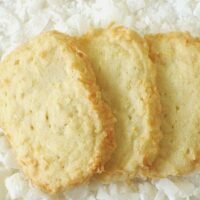 I just made this shortbread recipe. Not only was it the best method I’ve ever tried, it is also the most delicious I have ever tried. I might try a drizzle of chocolate on them next. Thank you! Yes, yes….chocolate would be very tasty. I just made some! Mine aren’t nearly as pretty as yours, but they sure do taste good. I went all out and bought the almond extract for the icing. I think it’s great. Happy Valentine’s Day! Stress-free rolling sounds wonderful. 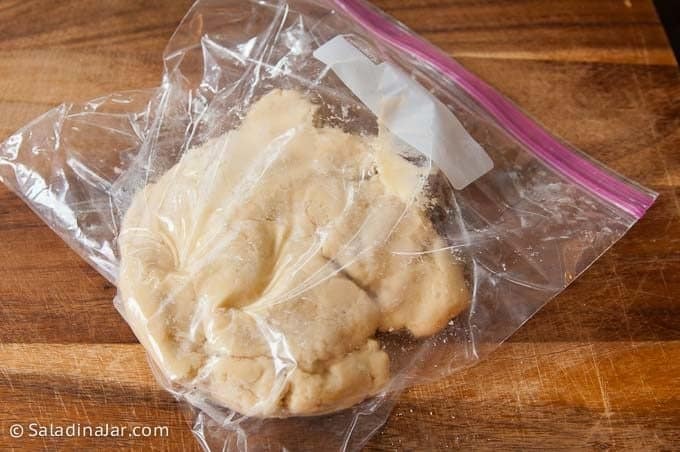 Iced shortbread is my absolute favorite sweet treat. How cute and pretty! 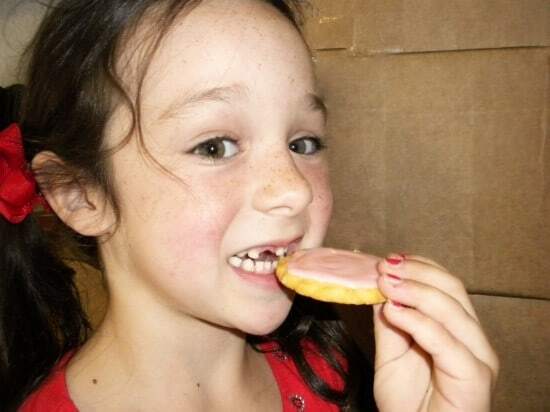 I love shortbread! 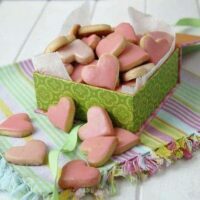 These shortbread cookies look fabulous! 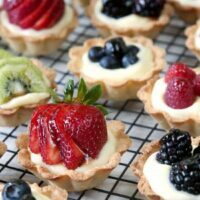 All I would need is a good cup of coffee and a few of these tasty treats and I would be in a happy place. Wow! Awesome idea about the plastic bag! I will definitely be trying that out! 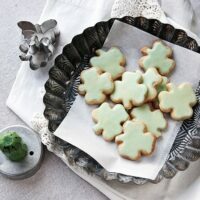 These cookies are delicious! !